The next time you look at a new Ford Mustang, here's something interesting to notice. It doesn't say "Ford" or "Mustang" anywhere on it. There's no blue oval. There's no chrome name badge. But you absolutely know what you're looking at and so does everyone else. That kind of recognition is one reason -- really, the biggest reason -- that, when Ford announced it was dropping its car models in favor of SUVs and SUV-like vehicles, the Mustang was left standing. It's now the best-selling sports car in the world but, in a way, that's not saying much. In 1965, its first full year on the market, Ford sold well over a half million Mustangs in just North America. This past year, with sales spread over 146 nations, Ford sold about 126,000. But the Mustang is as important to Ford as it has ever been. Maybe more than ever. "It's become an ambassador," said Michael Harley, executive editor of the auto Web site Kelley Blue Book. As a national symbol, the Mustang is to America what, say, a Ferrari is to Italy or a Jaguar is to England. It's cheaper than those cars, of course, but that's part of its symbolism. It has always been an egalitarian sports car, available at a wide range of performance and price levels and with enough storage space and seating to be used regularly, at least by those without a large family. The Mustang is important as much for the image it gives Ford as for its actual sales numbers. 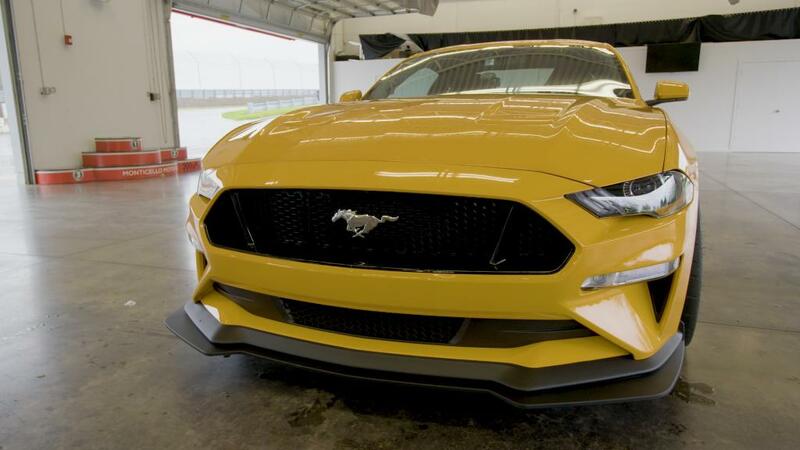 One of the most interesting aspects of the Mustang is its singularity even among Ford Motor Co. products. In the auto industry profits are made through "platform sharing." Rather than start from scratch with every car and SUV, engineers and designers will work together to create a basic engineering set-up, called a "platform," that can be used with various body styles and designs, referred to as "top hats." For example, the Ford Fusion sedan and Edge SUV, as well as the Lincoln Continental, MKZ and MKX are all based on the same essential platform. Other Ford models sold elsewhere in the world also share that platform. The Mustang, on the other hand, shares its platform with no other car. To get anything close to the economies of scale needed to make this work, Ford builds an incredible array of Mustangs. Buyers can get anything from a $26,000 Mustang with a 310-horsepower turbocharged four-cylinder engine to a $56,000 526 horsepower Shelby GT350. A Shelby GT500 with something over 700 horsepower is expected soon, too. 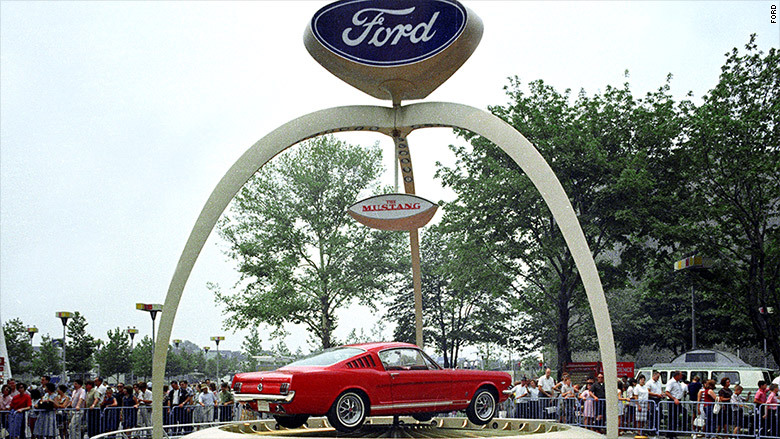 After it was unveiled at the 1964 World's Fair in New York the Mustang became an immediate sensation. The model has remained in production ever since. Only with its most recent re-engineering, which started production in 2014, did Ford make the Mustang available around the world. The excitement was ready made. American movies, TV shows and pop songs had already made the Mustang famous everywhere. The Mustang was, for a time after its introduction there, the number one sports car in Germany, home of Porsche. It is now the number one selling sports car in China. 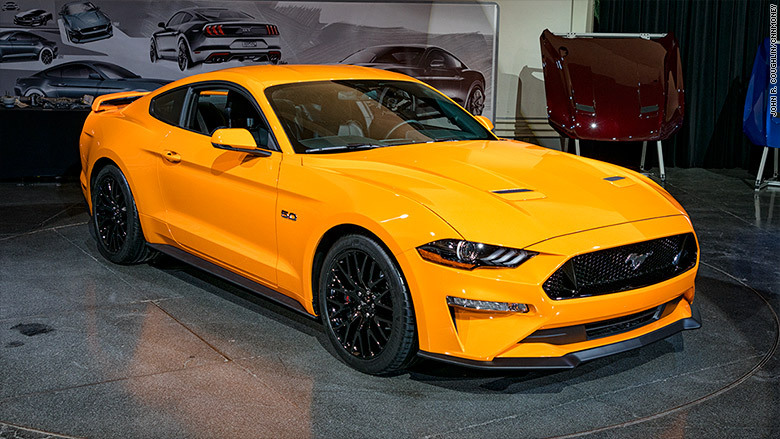 But, even if the Mustang were still only available in the United States, where just 82,000 were sold last year, Ford would keep making it, said Mark Schaller, Mustang brand manager at Ford. First of all, that's not a terrible number -- GM (GM) sells far fewer Corvettes -- but, mostly, it's just too important to the brand to let it go. Even though it doesn't wear the "blue oval" badge, the Mustang is still, arguably, Ford's most important marketing tool.